It’s one of literature’s great strengths that it constantly reinvents itself. Form and structure – and the conventions that govern these – are continually changing and evolving. Because of this, readers are often generously inclined towards literary experimentation. We are prepared to listen to new voices as they willfully disembowel storytelling as we know it. Mark Z. Danielewski is one of a handful of authors to have achieved commercial success while doing so. His debut novel, House of Leaves, has a widespread cult following; his second, Only Revolutions, was a finalist for the National Book Award. If we haven’t seen a major publication from him in six years, it only adds to his air of Salinger-like mystery. We imagine that he must have something major brewing. In this context, The Fifty Year Sword comes as a disappointment. The story is slight, and surprisingly predictable. His trademark misspellings and portmanteaus are irritating rather than illuminating. The imagery is obvious and intrusive. But what’s most disappointing is the lack of true innovation. Alongside House of Leaves – which shocked us with its rule-breaking layouts and spiraling narrative – The Fifty Year Sword looks remarkably pedestrian. The text occupies only the left-side pages, divided and staggered like a prose poem. The right-side pages are sometimes – but not always – used for accompanying photos of stitching by the Atelier Z group; most of the time these simply illustrate the story. What appears at first glance to be an experimental narrative turns out to be little more than illustrated verse. There’s also Danielewski’s use of colored quotation marks. When you first open the book this is one of its most striking features. In a foreword the author explains that the five colors relate to five interviewees, “to delineate their respective and independently conducted interviews”. Danielewski claims that the process was conceived to avoid “characterizing phrases, temporal references, and even more quotation marks hopelessly nested within reiterating nests of still more marks,” but in fact it falls prey to exactly these flaws. There are so many open quotations, within other quotations, within even more quotations, that it takes only a few pages for the reader to get hopelessly lost. The colored punctuation becomes nothing more than a fanciful prettification of the page. The five speakers blur into one indistinct voice. We can assume that the author failed in his experiment, or that his true intention was exactly this blur of confusion. Either way, it adds nothing to our enjoyment or understanding of the story. The narrative itself is possibly the most straightforward element of The Fifty Year Sword, and as such it both satisfies and leaves us hungry for more. Presented as a non-experimental narrative it would seem slight and contrived; surrounded by formal experiments it becomes a life raft of simplicity. A seamstress arrives at a Halloween party in East Texas, only to discover that the party will also celebrate the fiftieth birthday of a woman who seduced and slept with the seamstress’s husband. Before she can leave – or exact her revenge – a “bad man with a very black heart” arrives to read to a group of five orphan children. His story is violent and inappropriate, but he holds his audience rapt as he recounts his epic journey to buy a weapon unlike any other, and his purchase of the fifty year sword. The sword inflicts an invisible wound, a wound that only appears once the victim turns fifty. The obvious coincidence is, of course, no coincidence at all, and it doesn’t take a genius to work out where things are headed. Danielewski tries to achieve his effects through atmosphere and imagery rather than plot twists, but he doesn’t always succeed. Many of the images – the orphans, the mysterious storyteller, the darkened room illuminated by flickering candles – feel clichéd and trite. The interconnectivity of the stitched illustrations and the narrative’s needlework theme strengthens it a little, but even that feels heavy-handed in its execution. The stitching is unusual and intriguing; it doesn’t have to be echoed in the story to hold our interest. It’s in the nature of experimentation that it will sometimes fail. 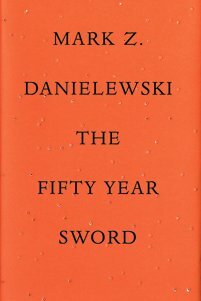 The Fifty Year Sword is undoubtedly the least impressive of Danielewski’s published work, and while we can respect his desire to explore new techniques and new formats, it falls short on almost every count. The story was originally presented as a live shadow play on Halloween, and it may be that its translation onto the page is to blame. Perhaps in the flesh, in a darkened room, this chorus of voices might have come to life. The book does not. In content, in conception, and in execution, it feels like a minor work, a short story that has been dressed in the Emperor’s new clothes. Even Danielewski’s stitchwork isn’t enough to cover its shortcomings. There is still a positive note to end on. News broke at the end of last year that Danielewski has signed a contract to write a 27-volume episodic novel called The Familiar, the first volumes of which are expected to start appearing in 2014. Maybe The Fifty Year Sword isn’t the book we’ve been waiting for after all. As a physical memento of a live reading – and the only work of fiction I know of to feature stitchwork illustrations – it just about scrapes by as a literary curio. For Danielewski’s next great experiment, however, we may have to wait another year.